Guess what premier do we have today? Klairs just launched their new product! It's called Klairs Freshly Juiced Vitamin E Mask. The name of this product might remind you of Klairs Freshly Juiced Vitamin C serum and it's not a coincidence! This mix of Vitamin E, Niacinamide and Adenosine boost the effectiveness of Vitamin C.
Klairs is a Korean brand that specifies in cruelty-free products. Their main motto is "simple but enough" - it means that Klairs won't offer us couple skincare series - all products are fitting every skin type. All the products are suitable for vegetarians and the brand is working to make all products suitable for vegans. The most important thing for me here is a spatula - there's a spatula and that's like a half of success. You know how much I like Klairs - the design reminds me a lot of Klairs Freshly Juiced Vitamin C Serum. There's no double lid in case you wonder. Water - a source of minerals and moisture. It’s the most basic element of the product. Glycerin - a humectant and a delicate preservative, but also a very powerful moisturizer. It helps other substances to get beneath the skin but it also regenerates the skin. Some people say it might be comedogenic, but in the comedogenic rating, this ingredient is placed very low. Butylene Glycol - a humectant and preservative, it helps other ingredients to get beneath the skin but it’s also a moisturizer. It can be comedogenic. Tocopheryl Acetate - a preservative and antioxidant. It’s a form of Vitamin E, it’s a good moisturizer and nourishing ingredient that helps with wrinkles. Niacinamide - one of the forms of Vitamin B3, a humectant and an antioxidant. It helps with collagen production but it’s usually used in cosmetics due to its brightening and whitening properties. It works on acne-prone skin very well because of its antiseptic properties. It’s a good moisturizer that can balance sebum production and help with lipid barrier. Sodium Hyaluronate - a humectant, an antioxidant and strong moisturizer that increases lipid barrier and skin elasticity. It can help with wrinkles and pigmentation. It’s a healing ingredient so it can help with post-acne scars, inflammation and speed up the healing process. Arrageenan - a vegan substitute for gelatin. It is used in cosmetics for its thickening properties. In this case, I think that Klairs was thinking about Carrageenan while writing Arrageenan on the label. Gellan Gum - an emulsifier and thickener. Betaine - a humectant with anti-static properties. It’s a strong moisturizer that makes skin and hair soft, it also makes wrinkles more smooth. Algin - a humectant and binding agent. Unfortunately, it can be comedogenic. Mannan - a film former. Ceramide NP - a good moisturiser. PEG-60 Hydrogenated Castor Oil - an emulsifier and cleansing agent. It should be avoided during the pregnancy, it’s not the safest ingredient. Acrylates/C10-30 Alkyl Acrylate Crosspolymer - a thickener, it might be comedogenic. Chlorphenesin - a preservative, it shouldn’t be used by kids. Arginine - an amino acid and an antioxidant that gives the smell to the product but it has positive meaning for our skin that’s why it is used in many anti-aging products. Ethylhexylglycerin - a humectant and a preservative, it gives moisture to the skin. Centella Asiatica Extract - also known as Gotu Kola. A source of vitamins A, C and E. It’s an antioxidant with antiseptic and antibacterial properties. It can be used as a treatment for different problems like dark circles under eyes, acne, wrinkles, redness or even as an eczema treatment. It even works on cellulitis, sunburns and it can be used to remove scars that are why it is used in products for acne-prone skin. During the pregnancy, you have to use only small concentrations of this ingredient. Rubus Fruticosus (Blackberry) Fruit Extract - an extract full in vitamins such as Vitamin C and E. It has antibacterial and anti-inflammatory properties that’s why it can be used for acne-prone skin as well as for eczema. It’s also a powerful antioxidant so it’ll help with wrinkles, pigmentation, skin brightening and the loss of moisture. Salicornia Herbacea Extract - an antioxidant and good moisturizer. It has a good effect on the dull skin with pigmentation - Salicornia Herbacea has brightening properties. Phragmites Communis Extract - also called Lu Gen and Reed Rhizome, it’s an extract used in traditional medicine. It’s a source of vitamin C which is a good ingredient to make your skin brighten. Adenosine - an anti-aging ingredient that helps with collagen production. It doesn’t only make your skin smooth, but it can actually help with pigmentation and skin brightening. It’s also an antioxidant, but you shouldn’t mix it with caffeine because it makes this substance less effective. You should be careful with this substance during the pregnancy. Lavandula Angustifolia (Lavender) Oil - it’s a fragrance ingredient with antiseptic properties. Some people might have allergic reactions to this ingredient. Eucalyptus Globulus Leaf Oil - an oil with antiseptic and antibacterial properties. It’s a powerful ingredient that’s why it shouldn’t be used during the pregnancy. Pelargonium Graveolens Flower Oil - an oil with antibacterial properties. It is very effective on acne-prone skin, it doesn’t only kill the bacteria but it also speeds up the healing process. It shouldn’t be used during the pregnancy. Citrus Limon (Lemon) Peel Oil - a fragrance ingredient and an antioxidant with antibacterial properties. It makes skin brighter, but it can also help a little bit with wrinkles. It shouldn’t be used during the pregnancy. Citrus Aurantium Dulcis (Orange) Peel Oil - a fragrance ingredient and an antioxidant. It makes skin brighter, it shouldn’t be used during the pregnancy. Cananga Odorata Flower Oil - also known as Ylang Ylang oil, it’s a fragrance ingredient that works well on acne-prone skin because it moderates sebum production. The texture reminds me of a pudding - a coconut pudding but also it reminds me of greek yoghurt. It's a quite thick formula but it's easy to spread the product on the skin. I can easily smell the lavender and lemon in this product as well as some herbs, the smell is nice, somehow it reminds me of a drugstore. What's different - the mask will always return to the first form - you can make a big hole in the middle of the jar and it'll quickly fill the whole. Before I start the review: this product is recommended to use with Klairs Freshly Juiced Vitamin C Serum, the review of this product you can find here. Personally, I was using this mask with different Vitamin C serum. I've decided to use this product as a sleeping mask even if you can easily use it instead of a face cream - I've tried that too and it worked, I feel like it might be even better for acne-prone skin to use it instead a moisturizer, if your skin is sensitive then I recommend to use it as a normal mask. The main ingredients are Vitamin E, Adenosine and Niacinamide, but you can spot Sodium Hyaluronate and Glycerin in this product too. The product should help with skin moisture but it is also promoted as a product that improves wrinkles and prevents ageing - and I have to admit that it's a nice combination of ingredients and I can believe in these claims. I'm happy to see Centella Asiatica in this product because it always helps me with acne and pigmentation. I've tried this mask in a quite hard moment of my month - pre-period era. I feel like I'm not the only person who has this problem - for me, period = hormonal acne time. I'm always expecting the worst but I had maybe one or two pimples this time and the only thing I've changed was adding this mask to my routine. But acne is not the main subject here. This mask is all about moisture and I admit I can see the difference. Very small amount of the mask is enough to cover the whole face and neck - this mask really works on the neck area, it doesn't make it oily but moist and that's a plus. Same with the skin on my face but I've got one problem - I feel like after the night my skin is more oily than after using a Klairs Rich Moist Cream so for me this mask is a good option for 2-3 uses per week but not for a daily use. I can admit that my skin is softer and I feel like I'll use this sleeping pack instead of my favourite sleeping pack from Laneige - I almost can't smell both of them and that's a positive thing for me coz if the smell is too strong them I can't sleep. Overall, I feel very positive about this mask even if I can spot a PEG here, the ingredients aren't the worse and that's what I like about Klairs. This product is vegetarian-friendly - unfortunately, I wasn't able to find the information if this product is vegan-friendly. 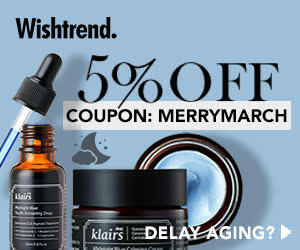 You can get this Klairs Freshly Juiced Vitamin E Mask on Wishtrend ($21.60/90ml - regular price is 27$). Wishtrend has a special offer now and you can get this mask + Vitamin C Serum for $35 - link here. You can also use code "MINISEPTWISH" to get two Klairs miniature toner. It's a nice sleeping mask which you can use instead of a moisturizer. My first impression of this product was positive and with every use, I'm falling in love more and more. I feel like this packaging will last about a year because I need a small amount to cover my whole face and get enough moisture - it's an ideal product for winter. Let me know in the comments what do you like about this product. Have you ever tried a sleeping mask? Do you know Klairs? Zgadnijcie jaką premierę mamy dzisiaj? Klairs właśnie wypuściło nowy produkt! Zwie się on Klairs Freshly Juiced Vitamin E Mask. Nazwa produktu może przypominać Wam do złudzenia nazwę serum Klairs Freshly Juiced Vitamin C Serum i nie jest to zbieg okoliczności!. Maseczka to mieszanka witaminy E, niacynamidu i adenozyny, która ma podbić działanie witaminy C.
Klairs to koreańska marka specjalizująca się w produktach cruelty-free. Główne motto marki brzmi „simple but enough”, co oznacza, że marka Klairs nie zaoferuje nam kilku serii produktów, a jedną serię, która będzie odpowiednia dla każdego typu cery. Wszystkie produkty marki są odpowiednie dla wegetarian, a marka pracuje nad zmianą formuł na odpowiednie dla wegan. Najważniejszą dla mnie rzeczą w opakowaniu jest szpatułka - ta maseczka ją posiada i jest to połowa sukcesu. Wiecie dobrze, jak bardzo lubię Klairs - opakowanie bardzo mocno przypomina Klairs Freshly Juiced Vitamin C Serum. W tym przypadku maseczka nie posiada dodatkowego zabezpieczenia jakim jest dodatkowy dekielek. Water (woda) - źródło minerałów i nawilżenia. Jest to podstawowy element w produkcie. Glycerin (gliceryna) - humektant i delikatny konserwant, ale również dobry nawilżacz. Pomaga innym substancją do przeniknięcia w głębsze warstwy skóry, ale również regeneruje skórę. Niektórzy twierdzą, że substancja ta może być komedogenna, jednak w rankingach komedogenności gliceryna uplasowała się bardzo nisko. Butylene Glycol (glikol butylenowy) - humektant i konserwant, pomaga innym składnikom w przedostanium się do głębi skóry, jest to dobry nawilżacz. Może być komedogenny. Tocopheryl Acetate (octan tokoferylu) - konserwant i antyoksydant. Forma witaminy E, dobry nawilżacz i składnik odżywczy, który działa na zmarszczki. Niacinamide (niacynamid) - jedna z form witaminy B3, humektant i antyoksydant. Pomaga w produkcji kolagenu, jednak najczęściej używany jest w kosmetyce ze względu na właściwości rozjaśniające i wybielające. Dobrze sobie radzi z cerą trądzikową ze względu na właściwości antyseptyczne. To dobry nawilżacz, który balansuje produkcję sebum oraz wzmacnia barierę lipidową skóry. Sodium Hyaluronate (kwas hialuronowy) - humektant, antyoksydant i silny nawilżacz, który poprawia barierę lipidową skóry jak i jej elastyczność. Działa na zmarszczki i problemy z przebarwieniami. Jest to składnik, który działa uzdrawiająco na blizny potrądzikowe oraz stany zapalne - przyśpiesza proces leczenia. Arrageenan - wegański substytut dla żelatyny. Używany w kosmetyce jako zagęstnik. Wydaje mi się, że marce chodziło o Carrageenan. Gellan Gum (guma gellan) - emulgator i zagęstnik. Betaine (Betainy) - humektant i substancja antystatyczna. Jest to silny nawilżacz, który wygładza skórę i włosy. Algin (alginian sodu) - humektant i substancja łącząca. Niestety, może być komedogenny. Mannan - substancja tworząca film na skórze. Ceramide NP - dobry nawilżacz. PEG-60 Hydrogenated Castor Oil - emulgator i substancja myjąca. Należy unikać go w czasie ciąży, nie jest to najbezpieczniejsza substancja. Acrylates/C10-30 Alkyl Acrylate Crosspolymer - zagęszczacz, który może być komedogenny. Chlorphenesin (chloropenezyna) - konserwant, nie powinien być używany przez dzieci. Arginine (arginina) - aminokwas i antyoksydant, który nadaje zapachu, ale ma również pozytywne znaczenie dla cery dlatego też używa się go często w produktach przeciwzmarszczkowych. Ethylhexylglycerin (etyloheksylogliceryna) - humektant i konserwant, nadaje skórze nawilżenia. Centella Asiatica Extract (wyciąg z wąkroty azjatyckiej) - zwany też Gotu Kola. Źródło witamin A, C i E. Jest to antyoksydant z działaniem antyseptycznym i antybakteryjnym. Może być używany jako środek na wiele problemów takich jak cienie pod oczami, trądzik, zmarszczki, przy cerze naczynkowej i zaczerwienieniu, a nawet jako środek na egzemę. Działa na cellulitis, poparzenia słoneczne oraz pomaga w usuwaniu blizn dlatego też cieszy się popularnością w produktach przeciwtrądzikowych. Podczas ciąży zaleca się używanie wyciągu z wąkroty w małych stężeniach. Rubus Fruticosus (Blackberry) Fruit Extract (wyciąg z owoców jeżyny) - ekstrakt bogaty w witaminy takie jak witamina C i E. Posiada właściwości antybakteryjne i przeciwzapalne. Jest to silny antyoksydant dlatego też sprawdza się przy zmarszczkach, przebarwieniach, rozjaśnianiu cery i przy utracie nawilżenia. Salicornia Herbacea Extract (ekstrakt z solirodu zielnego) - antyoksydant i dobry nawilżacz. Dobrze działa na cerę poszarzałą ze skłonnościami do przebarwień, salicornia herbacea posiada właściwości rozjaśniające cerę. Phragmites Communis Extract - zwany też Lu Gen czy Reed Rhizome. Ekstrakt ten używany jest w medycynie tradycyjnej. To źródło witaminy C, która rozjaśnia cerę. Adenosine (adenozyna) - składnik przeciwzmarszczkowy, który pomaga w produkcji kolagenu. Nie tylko sprawi, że Twoja cera stanie się miękka, ale również pomoże z przebarwieniami i rozjaśni cerę. To również antyoksydant, którego nie należy mieszać z kofeiną, ponieważ jego działanie w takim połączeniu stanie się słabsze. Należy uważać na ten składnik w czasie ciąży. Lavandula Angustifolia (Lavender) Oil (olejek lawendowy) - składnik zapachowy z właściwościami przeciwzapalnymi. U niektórych osób może pojawić się reakcja alergiczna na ten składnik. Eucalyptus Globulus Leaf Oil (olej z liści eukaliptusa) - olej z właściwościami przeciwbakteryjnymi i antyseptycznymi. Jest to silny w działaniu składnik, dlatego nie powinno się stosować go w czasie ciąży. Pelargonium Graveolens Flower Oil (olejek z kwiatów pelargonii pachnącej) - olej z właściwościami przeciwbakteryjnymi. Bardzo dobrze sprawdza się na cerze trądzikowej, nie tylko zabija bakterie, ale i przyśpiesza proces gojenia się ran. Nie należy używać go w czasie ciąży. Citrus Limon (Lemon) Peel Oil (olejek eteryczny ze skórki cytryny) - składnik zapachowy i antyoksydant z właściwościami antybakteryjnymi. Rozjaśnia cerę, ale również może pomóc ze zmarszczkami. Nie należy stosować go w czasie ciąży. Citrus Aurantium Dulcis (Orange) Peel Oil (olejek eteryczny ze skórki pomarańczy) - składnik zapachowy i antyoksydant. Rozjaśnia cerę, jednak nie należy stosować go w czasie ciąży. Cananga Odorata Flower Oil (olejek z kwiatu jagodlinu wonnego) - zwany też olejkiem Ylang Ylang, składnik zapachowy, który dobrze działa na cerze trądzikowej ze względu na regulację produkcji sebum. Konsystencja przypomina mi budyń kokosowy albo jakiś grecki jogurt. Jest to dość gęsta formuła, jednak łatwa do aplikacji. Przyznam, że wyczuwam zapach lawendy i cytryny w produkcie, tak samo jak zioła. Zapach jest całkiem przyjemny, trochę pachnie jak w aptece lub sklepie zielarskim. Co dziwnego zaobserwowałam - maseczka powraca do swej pierwotnej formy czyli jeśli wybierzemy maseczkę z samego środka to szybko środek ulegnie wypełnieniu. Jak maseczka zadziałała u mnie? Zanim zacznę recenzję: produkt ten zaleca się używać z serum Klairs Freshly Juiced Vitamin C Serum, recenzję serum znajdziecie na w tym poście. W moim przypadku zdecydowałam się na użycie maseczki z innym serum opartym na witaminie C. Maseczkę używałam jako sleeping pack czyli maseczka na noc jednak możecie zastąpić nią krem do twarzy na noc - spróbowałam i również u mnie ten sposób podziałał, mam nawet wrażenie, że pominięcie kremu jest lepsze dla mojej cery, ponieważ rano moja cera mieszana była cała tłusta. Jeśli jesteście posiadaczkami czy posiadaczami cery wrażliwej to polecałabym jednak użycie maseczki jako normalna maseczka do zmycia po kilkunastu minutach. Główne składniki produktu to witamina E, adenozyna i niacynamid, mimo że w składzie znajdziemy również kwas hialuronowy czy glicerynę. Produkt pomoże z nawilżeniem cery, ale również promowany jest jako produkt poprawiający zmarszczki czy zwalniający procesy starzenia się cery - muszę przyznać, że jest to całkiem dobra kombinacja składników i mogę w te zapewnienia uwierzyć. Cieszę się, że w składzie pojawiła się Centella Asiatica, ponieważ pomaga ona na trądzik i przebarwienia. Maseczki używałam w dość ciężkim momencie dla mojej cery - sezonie przedokresowym. Pewnie nie jestem jedyna z tym problemem, okres = trądzik hormonalny. Zawsze oczekuje w tym czasie najgorszego, ale może wyszły na mojej skórze jedna czy dwie zmiany trądzikowe, a jedyna zmiana w mojej rutynie to dodanie tej maseczki. Ale nie na trądziku się skupiamy. Maseczka ma zapewnić nam nawilżenie i muszę przyznać, że odczuwam różnicę. Niewielka ilość maseczki wystarcza aby pokryć całą twarz i szyję - w moi m przypadku to właśnie okolice szyi odczuły najbardziej poprawę nawilżenia - maseczka nie sprawia, że skóra jest tłusta, a nawilżona co jest plusem. To samo z twarzą, jednak wydaje mi się, że gdy używam maski z kremem Klairs Rich Moist Cream to jednak cera jest tłustsza, bardziej obciążona dlatego też dla mnie użycie maseczki 2-3 razy w tygodniu jest wystarczające, nie odczuwam potrzeby używania maseczki każdego dnia. Muszę przyznać, że cera jest miękka i wydaje mi się, że będę po nią sięgać zamiast po mój ulubiony sleeping pack od Laneige, mimo, że obu maseczek na skórze nie czuje co dla mnie jest zaletą, ponieważ mocny zapach produktów często przeszkadza mi w śnie. Podsumujmy, mam pozytywne odczucia pomimo, że w składzie widzę PEG, mimo to skład nie jest zły, za co Klairs lubię. Produkt ten jest odpowiedni dla wegetarian - niestety, nie znalazłam informacji czy jest odpowiedni dla wegan. Maseczkę Klairs Freshly Juiced Vitamin E Mask znajdziesz na stronie Wishtrend ($21.60/90 ml, w sprzedaży regularnej bez ceny promocyjnej maseczka kosztuje $27). Z okazji premiery Wishtrend ma również dla Was ofertę maskę oraz serum z witaminą C dostaniecie za $35 - kliknij tutaj. Na stronie Wishtrend możecie użyć również kodu "MINISEPTWISH" aby otrzymać dwa miniaturowe toniki Klairs do Waszego zamówienia. To całkiem przyjemna maseczka na noc, którą można spokojnie użyć zamiast kremu. Moje pierwsze wrażenie było bardzo pozytywne, a z każdym użyciem coraz bardziej produkt przekonuje mnie do siebie. Mam wrażenie, że opakowanie spokojnie starczy mi na rok, ponieważ niewielka ilość maski z łatwością pokrywa całą twarz i zapewnia sporo nawilżenia - w sam raz na zimę. Dajcie mi znać w komentarzach czy Wam maseczka przypadła do gustu. Czy używacie maseczek na noc? Znacie markę Klairs? Znajdziesz mnie również na BLOGLOVIN | INSTAGRAM | FACEBOOK | PINTEREST.